After having read this interesting book by Michela Wrong, written in a similar style as “In the Footsteps of Mr. Kurtz: Living on the Brink of Disaster in the Congo” (which I really liked) – I am still confronted with some open, or rather: resulting questions this book has generated. And this although the issue itself – the bogus deals by the “Mount Kenya Mafia” – have been debated elsewhere numerous times. 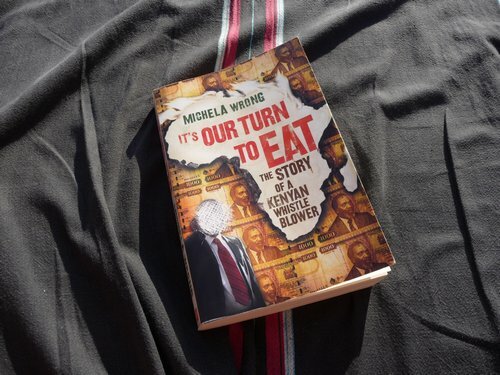 I chose so call it “elsewhere”, as Michela Wrong also mentioned the (Kenyan) blogosphere where John Githongo’s seemingly sudden departure from the official job & disclosure of cosa nostra secrets had been ripped apart in the usual manner. I am yet to see a German publication where the German blogosphere is taken into account with so much attention. This, however, may be related to their media and German sceptism which doubts anything that’s not published or confirmed by numerous sources. I take it that a lot of readers of my blog with an interest in Kenyan affairs also read, or at least read about this book, and have their own opinion of it. Another reason for blogging about this – already closed? – chapter of contemporary Kenyan history is that I can somehow relate to the described silver spoon upbringing of JG in a sense that a) discussions and intellectual discourse where part of the family life and b) that our generation – JG is 10 years older than me but I think most of you are just as old as I am (>30) – still enjoyed this limited or filtered view of the world, where everything new was sucked up with great interest for the lack of multiple media resources that would otherwise constantly penetrate your brain with “news”. I actually enjoyed this part the most during childhood – being forced to live in an environment where news would only dribble in, instead of showing up on the web-based RSS feedreader. Why? Because it enables you to take your time for your own development and dreams. I consider this a luxury that I am not taking for granted. Michela also mentioned this part where listening to the BBC World Service (instead of the montonous “HE DT arap Moi today said…” on KBC) was part of the daily habits. And I wouldn’t limit this to a family’s financial status as most Kenyans actually read more newspapers than e.g. Germans. Sooo…..my first question is: why was such a book written by a foreign observer? Why not by someone in Kenya or in the diaspora? Because of fears? Or because life is so hard & busy that there’s no time for such excursions? Or is it because of the culture which is so much forward-driven, with a focus on things to come instead of those that already happened? After the first 100 pages into the book, I thought it is a bit too Kikuyu-centric, but then, again, I think it’s Tucholsky who once said it is best to view your own country from the outside – and if these stereotypes (she even mentioned the jokes) are what it takes to draw a rough picture of this group for the uninformed world, then so be it. Which effect did this publication have on Kenyan society (within and outside of Kenya)? What’s with the role of a whistleblower (anyone still remembers David Munyakei?) in today’s Kenya and what about that anonymous reporting tool introduced @ KACC two years ago? What do you think about JG’s actions (as described via the book)? “Kenyans tend to quickly forgive or forget”… in the light of the post-election violence, a corruption scandal may not be that interesting after all. I also wondered how Kenyans would feel about this book + the story it tells. The way it was written, the examples used to explain historically-based feelings inside ethnic groups, the readership it was written for… questions that pop-up between the lines, how it feels to read about your own people, friends and known public figures. Michela also mentioned the network: “..he became aware of a delicate cobweb of expectations, obligations and duties tying him down” which makes Kenyan politics so interesting to me. It’s like having half of the Kenyan blogosphere / diaspora as friends on Facebook and Twitter, and then publishing opinionated status updates in a Koigi wa Wamwere manner. And, again, comparing Kenya to Germany (which is an on-going mission of this blog, I think), I am yet to see an interesting book on a contemporary German politician. Most of them are just as boring as their political agenda – which is also why Angela Merkel will most likely win the upcoming elections in Germany and remain Chancelorette for the next legislative period. Not because she’s any better or because she’s a woman (only positive reason, it seems), but because she has a network where she remains the queen at the center of the beehive. This is btw the same woman who once refused to meet with Barack Obama and later on licked his boots just because his network is so much more influential then hers. You know it’s a bit hypocritical to openly wonder about politics & corruption in an African state when at the same time Europe comes up with dictators leaders such as Silvio Berlusconi in Italy. You can write a book about just another African economy that has been corrupted in the past by the Hippo Generation and a laissez-faire mentality in society, and it will sell quite well. But a book on a corrupt European leader? No. Makes me wonder where our priorities are. Another detail or theme that I’ve been wondering about is the change on Kenyan culture. Yes, Kenyan culture. As paradox as it may seem – and I am not talking about books like “How to be a Kenyan” by the late Wahome Mutahi, the national dress once artificially invented by the Nyayo regime (Nyayo car??!) but rather this new Kenya which developed along with Moi’s last years, NARC and the 2002 elections and the spirit it brought to society since then. The appreciation of a society for cultural values – their own + shaped style, language, habits, new communication tools – has so often been an indicator to me of how a country actually performs. Please correct me if I am wrong on this, but I think that Kenya has in the past 10 years eventually found its own roots somewhere out there where local stars have become more interesting than foreigners, where the City of Nairobi is actually (& eventually!) regarded as a cosmopolitan place (despite frequent power failures & water shortages) and where there’s much more nationalism to be found these days which is not based on Obama’s Kenyan roots or just another sports athlete. And it’s not that Nairobi has never been that progressive before – only: the speed of growth seemingly increased tremendously, it seems (to me). Taking this new Nairobi as an indicator (! – pole for the NGO lingo) for things to come, where do these worlds of the old and new mix up to the bigger picture? When will we see the political change in Kenya the electorate voted for in 2002 and 2007? A new Kenya where power failures are a thing of the past, where broadband internet connections will help the youth stay in rural areas (vs. urbanisation), where water bodies are actually protected and land grabbing reversed for the sake of a growing nation? Where education and proper health care are top priorities? Questions which probably won’t be answered any time soon, but I secretly wish that integre characters like John Githongo are now using the time building up their support on the basis. Bottom-up instead of top-down – maybe that’s the new strategy these days – loosely joined forces that have a nation in mind and not their own pocket, where qualifications are more important than cosa nostra networks. Politics. I actually decided not to blog about politics anymore since January 2008, and this isn’t even meant to be book review. I’d love to read about your opinion of this book though, and maybe also find some answers to my given questions above and other things I’ve most definitely left out for various reasons. Thx! Ok, Njoroge, points taken on her marketing & the Munyakei alternative by Kwani Trust that didn’t receive as much publicity. I actually never really cared about the purported ban of her book as it doesn’t say anything about its real content. The content itself providing “no news to Kenyans” is an argument that doesn’t count to me because a) I know a lot of younger Kenyans who don’t have a clue about politics, b) the book apparently is to tell his (old?) story from her perspective and c) is supposed to generate some debate on this issue. So, yes, for the intellectuals it’s like cold tea without sugar, but then maybe we’re expecting too much from it anyways and are then disappointed. I also agree with you that the Western readership was targeted with this book. I never really expected anything else though. I’d love to read a book by a Kenyan about e.g. George W. Bush or Tony Blair one day that goes beyond the usual “How to write about Africa”-cynicism, aimed at Kenyans, and see how he would describe these wazungu worlds. My hard earned money can be put to better use .I doubt The book brings anything new to light apart from covering Githongo’s tracks and sanitizing his disregard for The Official Secrets Act.